B. Substitute a similar sized can. (I happen to prefer option A, I’m just sayin’!!) Keep in mind that if your can is a slightly different size, you may need to cut your fabric circle a little smaller or larger to accommodate. You can go crazy making these, using up all your little bits of fabric and trim and buttons…. I’ve used a combination of rice/beans and polyester filler for the stuffing. If you like to use crushed walnut shells, etc. that’s fine, too. See this blog post about different types of stuffing for your pin cushions. –Scraps of fabric, ribbon, rick rack, trim, etc. –Filling for pin cushion, such as rice/beans/sand/crushed walnut shells, etc. If desired, spray paint the can and allow to dry thoroughly. Glue fabric strip and/or trim to the can. Cut a circle of fabric. Use sewing thread to make a running stitch all around the circle, about 1/4” from the edge. Place a ball of polyester filling in the center and pull the thread to tighten. Add more polyester filling until the “tuffet” is packed quite tightly. Tie off the thread securely. Cut a piece of embroidery floss 31” long. Bring the thread through the bottom of the tuffet, leaving a 4” tail, and come up through the top center of the tuffet. Cut an 8” piece of embroidery floss and attach the button- bring the thread through the top of the tuffet, through the bottom and then back up through the top. Tie a knot on the top and cut off the excess. Fill the can about 2/3 full of rice or beans. Place glue along the top edge of the can. Carefully “squish” the tuffet slightly and insert into can. Allow glue to dry. 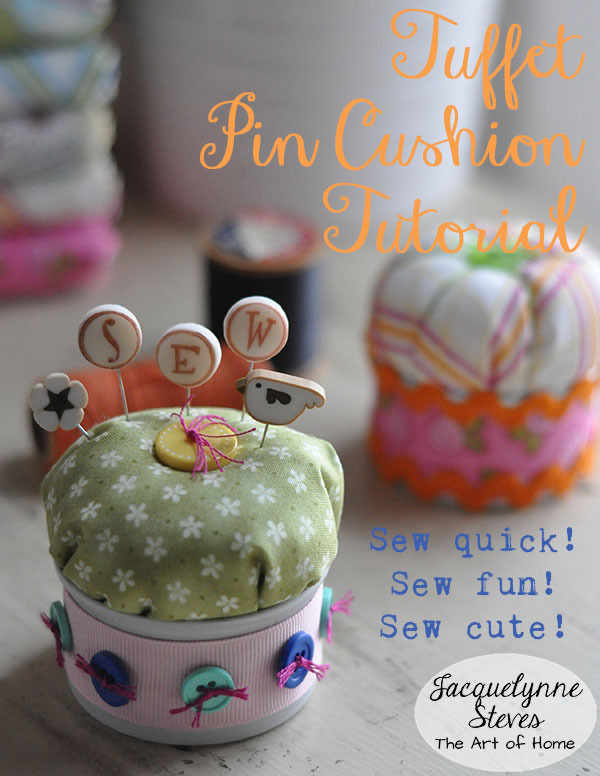 Decorate your pin cushion with some cute and colorful pins. 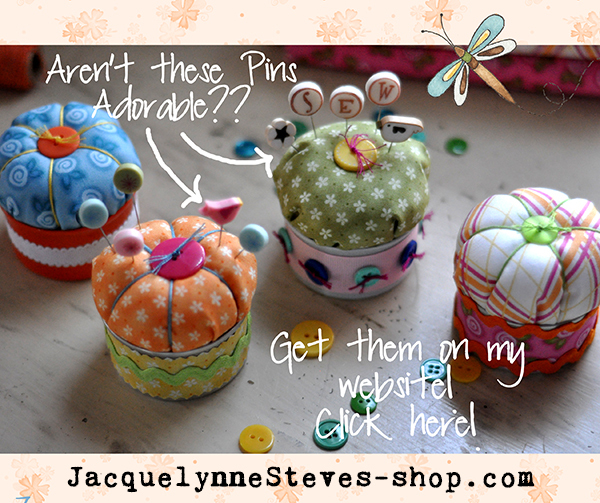 They are really the finishing touch to make your pin cushion irresistible! Get our cute and colorful pins! Click here. Get the downloadable PDF of this tutorial here. This article was posted in Crafts & DIY, Featured, Sewing & Quilting, Sewing/Quilting Patterns, Tutorials. Bookmark the permalink. Follow comments with the RSS feed for this post.Post a Comment or leave a trackback: Trackback URL. Love your site. I would fill the little tuffits with steel wool. It sharpens the pins when you put them in and out. I”m going to make a few of these when my pins come in :) and will post. Thanks for the ideas.